Energy and maintenance expenses account for approximately 75 percent of the life-cycle costs of a centrifugal pump. With a growing emphasis on reducing energy consumption driven by government regulation and businesses seeking operational and financial efficiencies, HVAC system designers are seeking system solutions that maximize efficiencies while reducing costs. 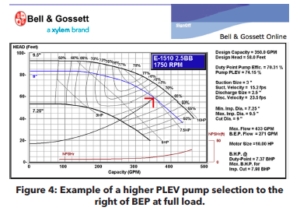 To address this demand and the industry’s evolution, Bell & Gossett (B&G), a Xylem brand, has introduced a new pump selection criteria called Part Load Efficiency Value (PLEV). PLEV is a calculation that represents the efficiency of the pump at partial flow rates and can be used to gauge true pump performance within a hydronic system. Centrifugal pumps installed in HVAC systems typically operate in variable load applications that see a fluctuation of flow requirements based on the heating or cooling load of a building at any given time. General industry practice is to make pump selections based on a system’s design load, or the maximum capacity of the system. With this approach, the pump system efficiency is typically measured at 100 percent capacity, even though the system generally only operates at that level 1 percent of the time. Given the reality of how buildings actually operate, traditional sizing and measurement does not accurately reflect where pumps operate most of the time. This practice is a contributing factor to why the majority of systems today operate with oversized pumps, leading to inefficiencies. A pump is considered oversized when it does not operate within about 20 percent of its best efficiency point (BEP). There are a number of reasons why system designers oversize pumps, including adding safety margins beyond those factored into the design by pump manufacturers. Oversizing pumps is a common, yet often unnecessary, practice that increases the system’s operation, maintenance and capital costs. For example, oversizing the flow by 5 percent increases the energy demand by more than 15 percent. An increased flow of 10 percent raises the energy consumption by 30 percent. Practices such as throttling the pump or trimming the impeller combat the effects of oversized pumps to a certain extent, but they aren’t always the most efficient solutions. If a pump is so oversized that its flow must be throttled more than 50 percent, it should be replaced with a properly sized pump. Proper system design is a critical element in minimizing life-cycle costs and reducing power consumption. Studies have shown that 30 to 50 percent of the energy consumed by pump systems could be saved through equipment or control system changes. By matching the equipment more precisely to actual system demands, pumps will use less power and require less maintenance, reducing costs and extending equipment life. B&G’s PLEV formula creates a modern standard for the industry, providing the most accurate specification of a centrifugal pump at partial flow rates, in turn helping to eliminate oversizing often associated with system design. A, B, C and D are the pump efficiency values at 100 percent, 75 percent, 50 percent and 25 percent of flow rate and at the corresponding head value on the control curve. Based on the equation in Figure 1, during any given year the pump will operate at 100 percent flow (duty point) only 1 percent of the year; 75 percent flow 42 percent of the year; 50 percent flow 45 percent of the year and 25 percent flow 12 percent of the year. The subscript “v” denotes variable speed operation with the control, or fixed head, calculated within a system’s critical circuit. B&G’s ESP-PLUS software defaults to 30 percent of pump TDH (Total Design Head) to represent the minimum control head within a system. The American Society of Heating, Refrigerating and Air-Conditioning Engineers’ ASHRAE 90.1- 2013 guideline requires that the total head loss in a system be calculated making it natural to calculate the critical zone’s fixed head, too. This is the number that should be used as it represents a more accurate calculation, which will be reflected in the cost analysis. 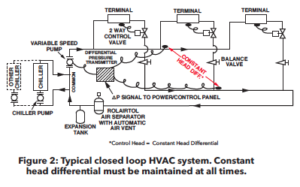 Most heating and cooling systems are closed loop and require a constant head differential at all times. The constant head differential is necessary for system control and to ensure that the necessary differential head across any controlled subcircuit is maintained during operation (Figures 2 and 3). PLEV can be used to accurately compare pumps from different manufactures to identify overall operational efficiency. The 30 percent TDH, or calculated minimum control head within the equipment schedule along with specifications, will ensure a fair comparison among manufacturers. PLEV provides system designers more latitude in selecting pumps to the right of BEP, as long as system head loss is calculated accurately (See Figure 4). Pump selections to the right of BEP may have a higher PLEV than other selections because the PLEV load profile is heavily weighted on operating hours at 75 percent and 50 percent operation. These load profile points account for 87 percent of operating hours. If system head loss has been estimated and a selection is made to the right of BEP, there is a risk that the pump will run outside the acceptable range of operation. In a worst-case scenario, the pump may run off the end of the pump curve. ASHRAE guidelines prefer pump selections between 85 and 105 percent of BEP. In pump selection for an open system, PLEV might not be a key selection criterion due to Net Positive Suction Head Required (NPSHr). Picking right of BEP generally increases NPSHr. PLEV can be considered as a factor in two-pump parallel pump selections but users must carefully evaluate the requirement for a point of intersection between the single pump curve and the system curve. The risk of selecting a pump with a higher PLEV or to the right of BEP will increase the likelihood that the single pump curve will not have a point of intersection. In general, selecting pumps to the left of BEP in multiple parallel pump systems continues to be a recommended practice to minimize operating costs as a whole. For closed loop HVAC systems, it’s common design practice to use 1800 RPM pump selections as they offer a number of advantages, such as increased mass to absorb system harmonics that could lead to unwanted vibration and higher efficiencies to left of BEP. Pump selections at higher speeds (3600 RPM) also offer significant advantages, such as smaller pumps and motors that yield lower first cost, less mechanical room space requirements, smaller pipe diameters and higher PLEV efficiencies. The differences are outlined in Figure 5. 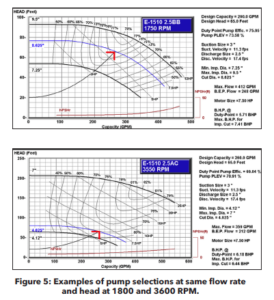 In applying PLEV as a pump selection criteria, it’s critical for designers to select pumps that operate at the highest efficiencies across the largest segment of the pump curve. 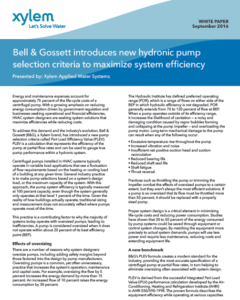 Newer pump designs incorporate cutting-edge computational fluid dynamics technology to increase efficiency, such as Bell & Gossett’s e-range of centrifugal pumps that operate efficiently to the left, or right of BEP. Bell & Gossett’s term for these efficiency ranges is Efficiency Islands. An Efficiency Island is an envelope on the performance curve where the pump operates as widely and as deeply as possible within the POR. These extensive efficiency profiles enable users to maintain significantly higher levels of efficiency over a much wider range of operating conditions, leading to lower power consumption and life-cycle cost, and increased pump reliability and overall system performance. When combining highly efficient pumps with the PLEV selection criteria, system designers can maximize operational performance while realizing energy and cost savings, as well as environmental benefits. More stringent pump efficiency standards are spurring system designers to seek smarter ways to specify pumps. The PLEV selection criteria and specially designed selection software offer them the tools to meet and exceed efficiency requirements. Mark Handzel is vice president, product regulatory affairs, and director, HVAC commercial buildings, Bell & Gossett, a Xylem brand. He is a member of the Appliance Standards and Rulemaking Federal Advisory Committee’s Commercial and Industrial Pumps Working Group.